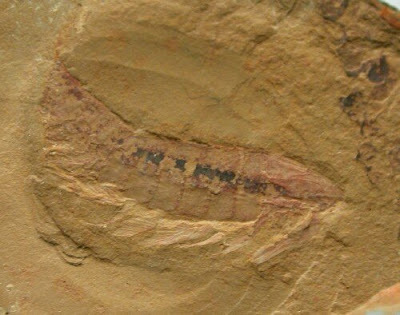 Life Before the Dinosaurs: Alalcomenaeus. 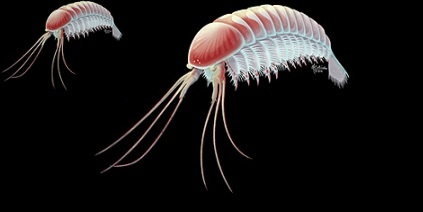 Alalcomenaeus is a Cambrian arthropod that was first classified as a crustacean, then an opabinid, but now some people believe it was an arachnomorph. Alalcomenaeus had five eyes. Three of its eyes were very small and were together on the front of its head. It also had two large stalked eyes. The arrangement of the eyes is similar to the eyes of a modern cicada. 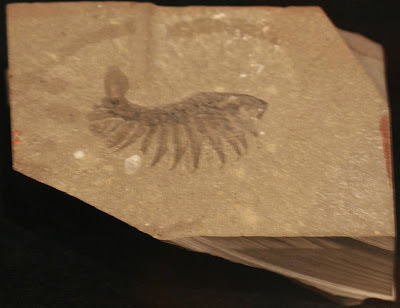 Alalcomenaeus had legs, but they were probably not for walking. The legs may have been for clinging onto plants or sponges, or for tearing up prey. Alalcomenaeus had eleven body segments and a shield covering its head. It had a flat telson, with short spikes on the back, that could have helped it swim. It had hairy lobes along the side, which could have also helped it swim. At first, when Alalcomenaeus was discovered in the Walcott quarry, only six specimens of it were found, and it was thought to be rare. But later, as the quarry was expanded, scientists found many specimens of Alalcomenaeus, and now it's believed to be a dominant species. The fossil at the end is quite beautiful; as always, thanks for writing! This one is my favorite so far. No disrespect to trilobites. How did you manage to download the reconstruction of the beast? I totally failed with the ROM website. Just goes to show the disadvantages of being 70 rather than 7. I'd quite like to download the illustrations from the original Briggs & Collins paper, but have had no luck with those either.